Epstein-Barr virus (EBV) is one of the most widespread human viruses, with over 80% of the general population exposed by young adulthood, as determined by antibody studies. Initial infection usu- ally occurs during childhood or the teenage years. It is clear that, de- pending on the age of the recipient, clinical manifestations of the primary infection can vary. It has been known for 20 years that EBV is the etiologic agent of acute infectious mononucleosis (IM) and is also closely associated with African Burkitt's lymphoma (BL) and naso- it is a pharyngeal carcinoma (NPC). There is increasing evidence that factor in the etiology of B-celllymphomas, which arise at a high fre- quency in immunodeficient populations. EBV may also contribute to the development of autoimmune disease. Thus, this virus continues to attract world-wide attention. The major target cell for EBV infection has now been conclusively identified as the complement receptor-type 2 (CR2), the Cd/Cdg 3 3 receptor on B lymphocyte. It is apparent, however, that other cells also can become infected by EBV, such as epithelial cells in the parotid gland and other epithelial cells in the upper respiratory tract. This might help account for the EBV-assodated carcinomas of the upper respiratory tract. 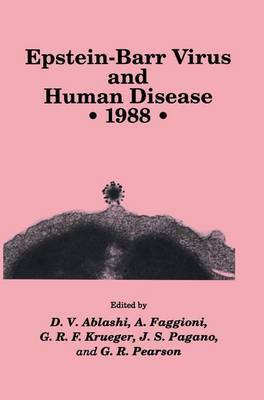 The first in a series of international symposia on EBV -associated diseases focused primarily on Burkitt's-type lymphomas or on NPC (Kyoto 1977; Dusseldorf 1980; Kuala Lumpur 1982) and emphasized mainly the clinical elements of these diseases. Subsequent symposia (Loutraki, 1984; St.